That he has been a resident of said County and State for more than five years. That he is an indigent Confederate soldier. That he served in the Confederate Army for more than three years, having been a private in the Seventh Georgia Regiment of Cavalry. 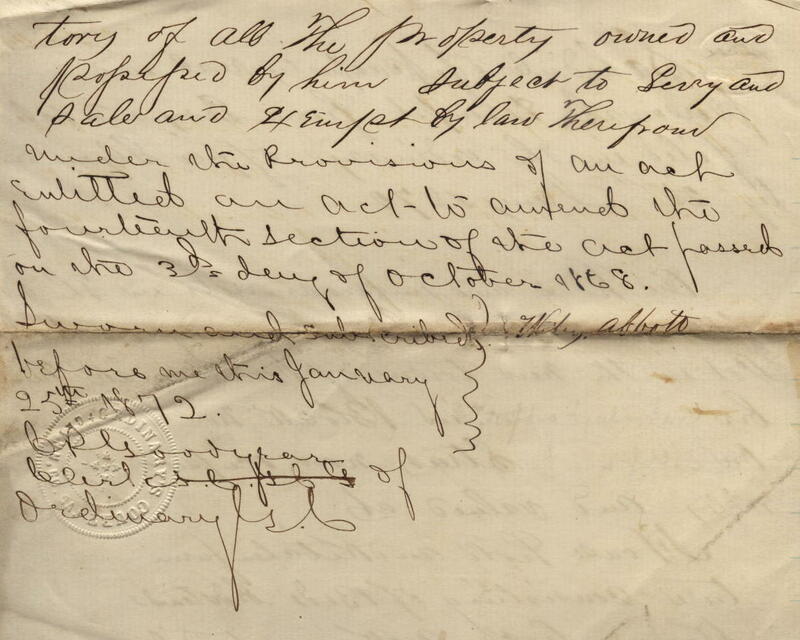 That as such indigent Confederate soldier he desires the privileges granted by section 1642, Vol. 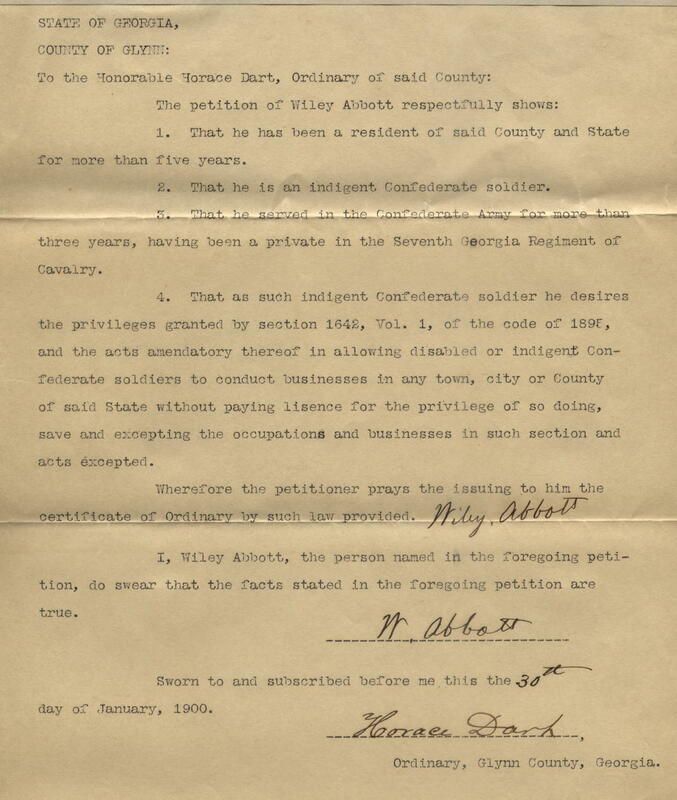 1, of the code of 1895, and the acts amendatory thereof in allowing disabled or indigent Confederate soldiers to conduct businesses in any town, city, or county of said state without paying license for the privilege of so doing, save and excepting the occupations and businesses in such section and acts excepted. Wherefore the petitioner prays the issuing to him the certificate of Ordinary by such law provided. I, Wiley Abbott, the person named in the foregoing petition, do swear that the facts stated in the foregoing petition are true. Sworn to and subscribed before me this the 30th day of January 1900. 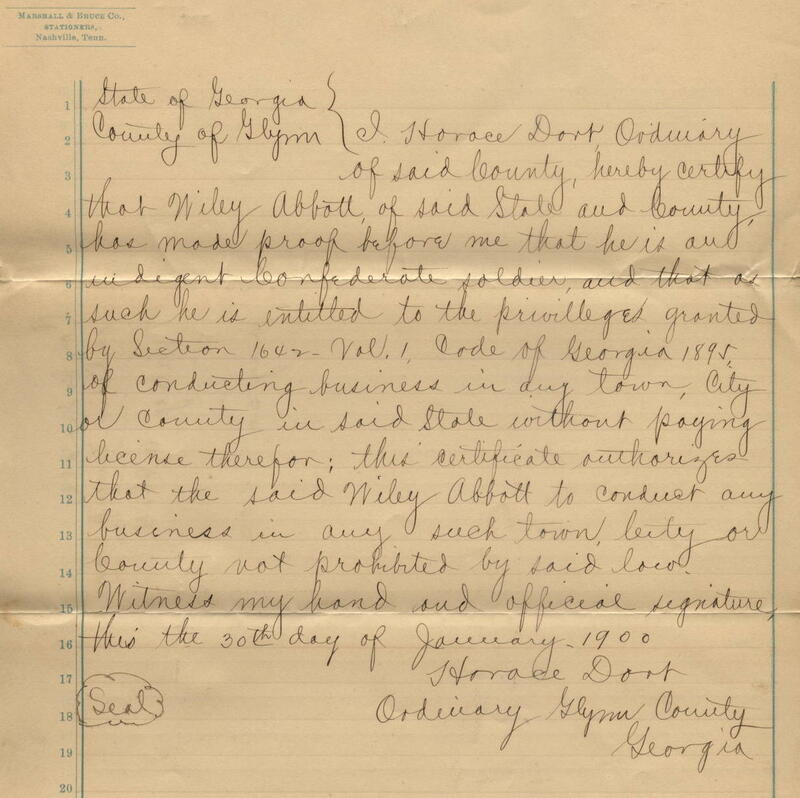 Signed: Horace Dart, Ordinary of Glynn County, Georgia. 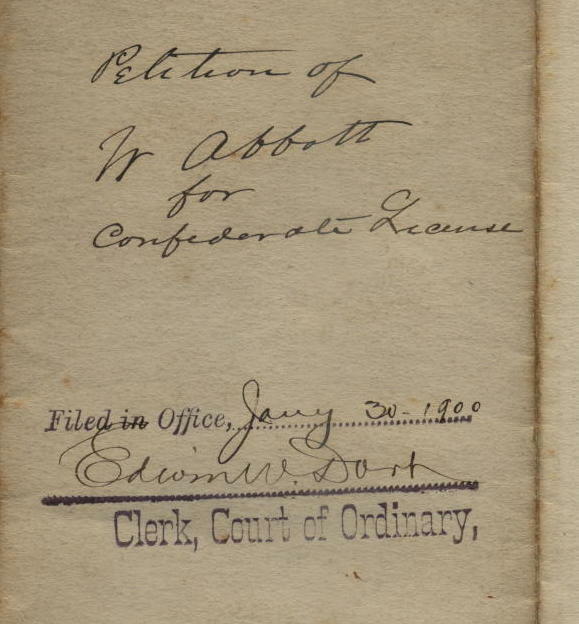 I Horace Dart, Ordinary of said County, hereby certify that Wiley Abbott of said State and County has made proof before me that he is and indigent Confederate soldier and that as such he is entitled to the privileges granted by section 1642, Vol. 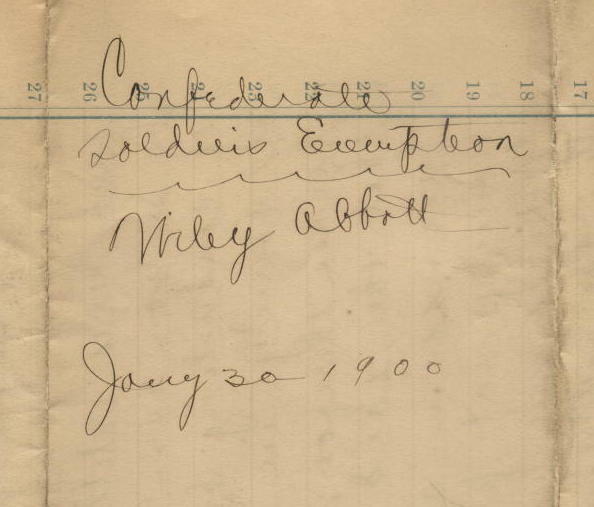 1, Code of Georgia 1895, of conducting business in any town, city, or county in said state without paying license therefore; this certificate outcharges that the said Wiley Abbott to conduct any business in any such town, city, or county not prohibited by said law. Witness my hand and official signature, this the 30th day of January 1900. 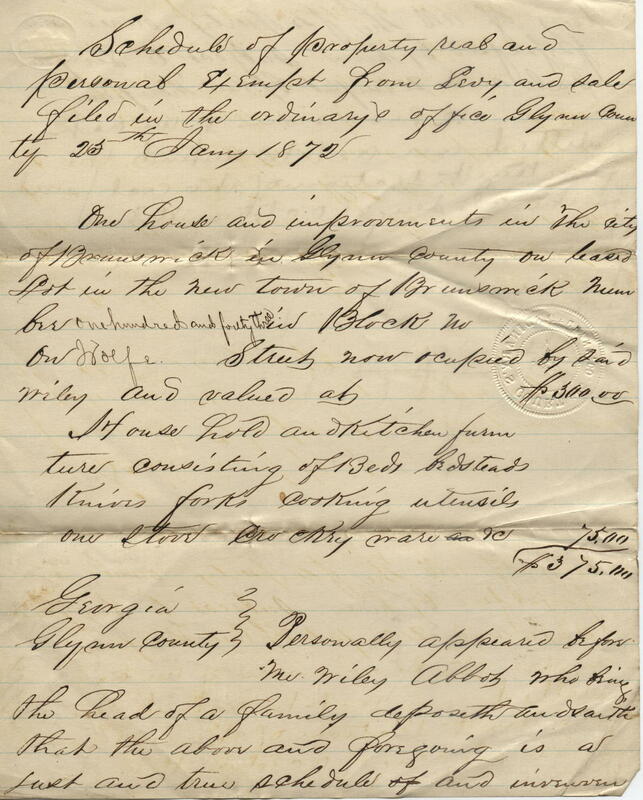 Schedule of property real and personal exempt from levy and sale filed in the ordinary's office Glynn County 25 January 1872. One house and improvements in the city of Brunswick in Glynn County on leased lot in the new town of Brunswick number 145, Block no (blank space) on Wolfe Street now occupied by said Wiley and valued at $300. Household and kitchen furniture consisting of beds, bedsteads, knives, forks, cooking utensils, one stove, crockery ware, etc. $75, total $375. Personally appeared before me Wiley Abbott who being the head of a family deposeth and saith that the above and foregoing is a just and true schedule and inventory of all the property owned and possessed by him subject to levy and sale and exempt by law therefore. Under the provision of an act entitled and act to amend the fortieth section of the act passed on the 3rd day of October 1868. 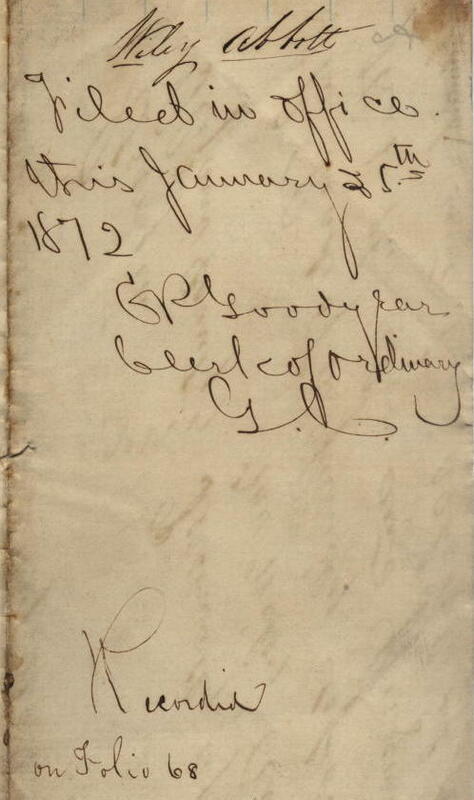 Signed and subscribed before me this 25 January 1872 G.P. Goodyear, clerk of Ordinary.